Edmonton International Airport is one of the five busiest airports in the North American country Canada. It is south of the capital of the province Alberta. 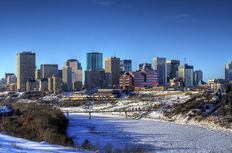 The airport is near the town of Nisku, on Highway 2 about 28 km ot 20 miles south of downtown Edmonton. Yes; paid short and long-term parking. Free shuttle to the terminal.